On 13th April 1971 Shri Sadhan Chandra Mistry, aged 35 years a vegetable vendor in the obscure village of Hanspukur, District South 24-Parganas, West Bengal, died of a very common and minor ailment, only because he could not get access to any medical attention whatsoever. He left behind his illiterate wife Subhasini (23 years then) with two sons and two daughters four to eight years in age. Naturally, the family plunged into utter poverty and Subhasini was forced out of her home within one month of her husband’s death, to sell vegetables in that hamlet market. That day, while she sat under the scorching sun selling vegetables and worrying about her children, she took a vow that one day she will build a hospital in that very village so that no poor villager would die for want of medical attention. Her fellow vendors and every person who heard of her vow laughed and made fun of her. How can she build a hospital, they jeered, when she cannot even mend her own thatched hut? She had to feed a family of five and marry two daughters. The village elders concluded her vow was all humbug and pure day dreaming out of having lost her mind. However, day in and out, Subhasini continued selling vegetables silently and looked after her children never allowing the fire in her frail body to douse even for a moment. 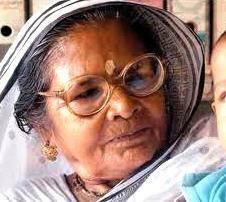 After persevering for twenty full years, ultimately she could start a clinic at her home for poor people. She managed to coax a doctor into coming to her village every week. And week after week, while tens of poor patients got medical attention from this lone clinic in the region, Subhasini became the most popular household name in her village. Now her fellow vendors and all others started respecting her. That was enough of a support for her. In the meantime, her children grew up. The two daughters were married off. The eldest son chose to be a labourer in the farm. Her other son, the youngest of the lot, Ajoy Mistry was chosen by Subhasini to carry on her mission. He successfully completed his secondary education and passed the All India Medical Entrance Test. Aided by the German Scholarship, he joined Calcutta Medical College where he completed his medical course. He worked hard as he studied, ran around from friends to well wishers to any person/organization he had access and managed to raise Rs.50,000 for his mothers mission. In 1993, Ajoy Mistry authored the trust deed of Humanity Trust with his mother Subhasini Mistry as the co-founder trustee. On 5th February 1995, the foundation stone for the Hospital was laid and on 9th March 1996, the Humanity Hospital was inaugurated and opened to public. The Hospital is a testimony of the will and spirit of a woman who defied social norms and a long series of obstacles to establish the first hospital in her backward village. Within one year, the trust could raise ten times the initial money to complete the first structure of the hospital. Soon, more donations followed and today, Subhasini Mistry can say with pride that she has fulfilled her pledge made to her husband two and half decades earlier. Humanity Hospital is certified and registered as a Hospital under the West Bengal Clinical Establishment Act. of 1950, managed by Humanity Trust formed on 4th March 1993. In the year 2000, Subhasini Mistry and Ajoy Mistry were honoured and named as the prestigious Paul Harris Fellow by the Rotary International, in appreciation of their service to humanity and poor people in particular. Today, despite the financial crunch to meet recurring expenses, the Hospital provides best services to poor and underprivileged sections of the society. You are One with everyone. When you are clear about this, your definition of self-interest will change. Thank you Raj Kumarji for sharing this inspiring story. The likes of Shubhashini are the building blocks of a Divine Society. May their tribe increase! How can one donate to Subhasini’s cause. Can you email me address and phone no., if you have it handy. it is really hard to believe how a poor woman turns the tide …with her sacrifice, dedication, patience and believe on self..